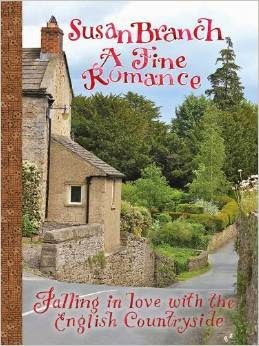 A Fine Romance: Falling in Love With the English Countryside , by Susan Branch and recommended that I check it out. I looked it up, thought it looked very exciting, and stuck it on my Amazon wishlist (where books remain until I can no longer resist them). Christmas came along and a dear friend of mine kindly gave me a gift bag which I opened except for one thing which I knew was a book. I stuck that under the tree to open on Christmas morning. I didn't allow myself to make guesses. I just told myself to wait. Christmas morning came and - as you have likely ascertained by now - I opened the packaging and discovered A Fine Romance . Sharp inhale. Joy! I couldn't put off the read any longer and I had no wish to! I dove right on it and found myself delighted with each and every page. Have you not heard of this book? Let me tell you about it. Of course, you might recognize the name Susan Branch from her country-style, pastel-colored artwork. In this book she describes and illustrates for us her two-month trip to England. She tells us of the food, the gardens, the people, and the beauty that is England. As I've mentioned a few times, we are currently planning a family trip to England this year which is why this book was brought to my attention in the first place. Reading this book made me not want to visit it any longer. No. Instead it made me think we ought to move to England for a good while and soak it all in slowly. Warning: reading this book makes your heart ache for the beauty and the history of England. I'm absolutely enamored! It's true that I can't seem to help it. I love a land that is so rich in history and that has let it stand. I love that they haven't torn down every brick and stone and replaced it with ugly cement. I love that they plant huge gardens and small ones and have kept random cobblestone streets. I love the narrow lanes and smaller cars and the idea of walking paths that criss-cross around the country. I love tea and green landscapes (made so bit a "bit of" rain) and, of course, their accents. It seems like a place where they respect that the past has happened and are consciously aware of the fact that they are not the first society ever to have been in existence. They build from the past, rally round each other in times of trouble, take firm(er) stands against country adversaries and still sit down for tea. To me it just sounds glorious (whereas to them it probably just sounds like life). I can't wait to get there. Despite my hesitations regarding boat travel, I truly hate to fly. But all things considered, I'd like to get the trip over with as soon as possible and seven nights at sea seems impractical and possibly more horrifying than an airplane ride. We shall fly our way there. Our families of origin have not traveled very widely at all but Jonathan and I would like to attempt to be more adventurous in raising our own family. We'd like to create a family culture that is excited about and willing to go new places and try new things. I think it's fair to say that we've been your typical Americans who really only think about what life is like from our current perspective. Within just these past few years we've found that leaving home and traveling around broadens our understanding of not just the world but also of ourselves. You see things differently when you travel. You encounter new arguments and practices and become a more flexible (almost useful) human being by leaving the home and exposing yourself to new things. Now, obviously, there are a whole lot of arguments wrapped up in that last sentence and this post is not going to provide answers and responses for each argument but, suffice it to say, we've noted a great value to the idea of traveling "outside of one's self" so to speak. That said, it's also incredibly hard and frequently a very scary thing to think of packing up and heading off to see the world (especially with four small children in tow!). Travel to me is scary but I think I'd wither and die without the possibility of it. I liked the fact that as Susan and her husband embarked on their adventures she realized (as we so often do) that travel is good for the soul. To see the world which God created is an incredibly amazing thing. His creation is astounding, each part so unique and beautiful in its own way. Truthfully, I am always tense before traveling but once "on the road" it is a rather exhilarating feeling. I'm not quite sure I'm describing it very well, but there it is. I have found it a happy thing to travel. Be spontaneous: go places where something pleasantly unexpected can happen to you. Don't complain about the weather. I remind myself of these very things before embarking on any sort of trip. I don't know that I can consider A Fine Romance a useful guide book of any sort, (although her driving tips, I believe, will come in handy! ), but rather a dreamer's book which is useful in making other heart's dream about the possibilities which exist in this world for them also. Will everyone be able to manage a trip to England? Likely no. But I think that you can always work to create situations and go places where unexpected, pleasant things can happen. Being inspired to meet new people and share the beauty which is life is not a bad thing, travel or no. Learning to take time out to create and/or make uniquely special moments with the people you love is something that is worth focusing on regardless of your travel possibilities. I would love this book even if I were not planning to go to England. Naturally, I find my heart less achy because I know it's around the corner but regardless, this book is charming in every way and I'm so very, very glad to have read it. Exceeding my gratefulness to have read this book is my gratefulness for the friend who gave it to me. She inspires me to look for new opportunities to enjoy life with my family every day. And I know of no other person who loves to create beauty as much as she. That she thought to give me this book warms me heart and soul and I thank her for the gift. P.S. I took a picture of my copy of this book with my cup of tea because I thought it would be fitting to post a "journal-style" photo of the book. However, I have yet to download that picture off of the camera so I'll have to share it later. I shall have to live vicariously through you, my friend. :). I DO hope to get back to England one day and see the sights I didn't see almost 20 years ago. Someday! I enjoyed this post, Carrie. I used to be an avid traveler and more adventurous person, and that truly feels like a lifetime ago (although it was more like 10-15 years ago). How exciting that your family is planning a trip abroad this year! I love her art work - I'm sure this is a lovely as well as an inspiring book, especially poignant in light of your upcoming trip. I love this post! Although I have no immediate plans to travel to England, I want to read this book just because of your review. I love the points about being spontaneous and not complaining about the weather and plan to incorporate them on my husband's and my upcoming cruise (for yes, we are going on our first cruise ever--thanks for planting Titanic thoughts in my head, friend!) I am surprised that you hate flying so much--I LOVE it, for there is nothing to do but read. No guilt. While our travels have been severely curtailed by four adoptions in eight years, I agree heartily with your paragraph about the benefits of travel and in fact have a post started about looking outside of ourselves and our "small pond in which we are a big fish" which I may someday actually manage to finish and publish. :) Thank you so much for sharing this post! Awww, your post makes me want to get this book AND travel! I think the last time I traveled out of my own little state was right after I was married.